Actually, I doubt it'll be side talkin'. Russell Beattie has an entry on his weblog about the Sony PSP. This is a device that has fascinated me (along with the rest of the world) ever since I first heard about it. Anyway, the piece discusses the PSP as a mobile computing platform. I did a little digging after reading this and found out, through a site called Joystiq, that Sony has just confirmed the PSP will be mobile phone capable - apparently through an adjunct attachment of some sort. Also, it will have a web browser built in. Sony is still noncommital about a keyboard for the PSP. But recent rumors about a word processing beta - as well as, possibly, this mockup - indicate that one might be in the offing. So, let's see, what do we have here? Games, both single-player and, thanks to on board Wi-Fi, multi-player; movies; music; internet; telephony. You can easily imagine other software apps being written, such as photo storage and viewing, and chat. Clearly, then, we have in the PSP a converged handheld device that will be more powerful than anything else available, at anywhere near the price (reportedly $150-200 when it hits the U.S. in March). 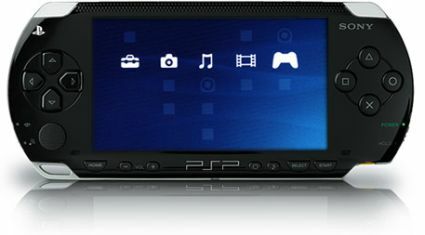 Play-asia.com has some great pics of the PSP and its accessories, as well as tons of PSP videos, here. And if you live in North America and just can't wait, you can buy one now, from eXpansys, at a slight premium :)- Japanese version only. Do you think Sony will do the logical, wise, ambitious thing, and offer Sony owned media preformated onto PSP disks? I'm thinking Sony Pictures, Columbia, TriStar - and whatever else they own. Thanks, Russ, for inspiring me to talk about my favorite device upcoming.